Charleston Chew Vanilla | ZOMG, Candy! I’ve seen Charleston Chews (BUY) around grocery stores before, but only in big bags. I couldn’t figure out exactly what they were from the packaging, so I wasn’t ready to commit to buying a whole bag. Fortunately, I found this lone… bar? rod? roll?… version to try. 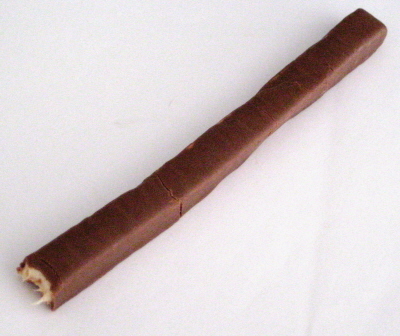 The Charleston Chew is a roll of vanilla nougat (the Tootsie Roll website says that they also come in chocolate and strawberry) covered in a thin layer of chocolate. The chocolate coating smelled of cheap, mass produced chocolate and tasted like it too. Then again, there’s something to be said for cheap, mass produced chocolate. Sometimes it can be transporting, like Proust’s madeleine. And from the retro look of the packaging, it seems that the Charleston Chew is dependent upon its ability to bring people back to their childhoods. All in all, it’s not a bad bar. The vanilla nougat is soft and yielding, with a manageable amount of sticks-to-your-teeth-ness. Alas, I left the rest of this at home, so I will not be able to try the frozen version. If I could find the single rolls in chocolate and strawberry, I’d buy them to try them, but I wouldn’t bother buying an entire box or bag of them. Entry filed under: chewy, chocolate, nougat, OM, review.